In its bid to appease the Muslim population before next year's Assembly elections, Mamata Banerjee's government has announced festival bonus for those state government employees who belong to the minority community. These employees whose monthly salaries are within Rs Rs 24,000 will get Rs 3,200 as festival bonus on July 15, ahead of the Eid. State finance minister Amit Mitra told reporters that the government will have to bear an additional expenditure of Rs 400 crore for the purpose. "The state government will. 400 crore for the payment use of bonus and festival advance to our employees. This is a gesture on our part before the festival season," Mitra said af ter announcing the scheme. But the finance minister remained silent about payment of dearness allowances (DA) to its employees. Presently, state government employees are getting lower DA than those who are employed with Central government establishments and there has been a very strong resentment among the state government employees over this discrimination. A senior official of the finance depart ment said that the government might announce a significant increase in payment of DA to its employees by the year end or early next year. Assembly elections in Bengal will take place before May in 2016 and by announcing DA payment before that Mamata's government might take the opportunity to appease its employees before the polls.Apart from giving festival bonus, the state government has also decided to give festival advance to its employees. Employees whose salaries fall between Rs 35,000, are Rs 24,000 and eligible to take festival ad vance worth Rs 3500. But the employees will have to repay this advance maximum in eight instalments. State government employees who do not belong to the minority community, will also get festival bonus which will be paid to them between October 5 and 9. In what could come in handy for the ruling Trinamool Congress ahead of the 2014 general elections West Bengal Government has spent about 160 per cent more than what it used to for the minorities two years before. Releasing the figures State Finance Minister Amit Mitra on Thursday said the State which spent about Rs 330 crore for the minorities in 2011-2012 had upped the budget to Rs 859 crore in 2013-2014. The budget takes into account increase in scholarship for the Muslim students and extending coaching facilities to them for competitive examinations. This, apart from providing financial aid to self-employed people from the minority community. “It makes us proud to announce that our Government has effected a five-fold increase in the scholarships given to the Muslim students,” Mitra said adding how the past Left Government had a budget layout of only Rs 330 crore which had more than tripled in a matter of two years. “We are giving scholarship to 34 lakh students now whereas only about 7.4 lakh minority students used to get scholarship” during previous regime he maintained at a Government function adding the State. Urban Development Minister Firhad Hakim said the State was currently giving assistance to about 1.57 lakh self-employed people. 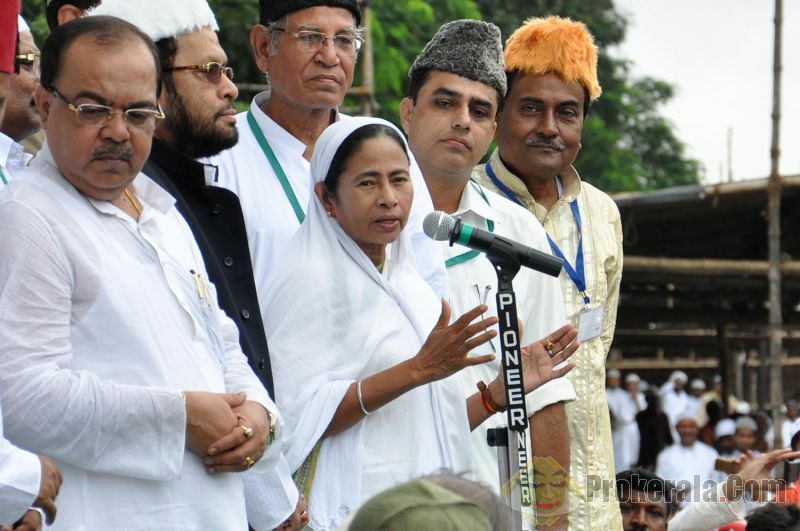 More than 25 percent of the State’s population is Muslim most of who had backed Chief Minister Mamata Banerjee in 2009 general elections and 2011 Assembly polls bringing her to power. Meanwhile, acting on the “advise” of a Muslim cleric the police on Thursday stopped the telecasting of a Bengali serial scripted by controversial Bangla writer Tasleema Nasreen Home Department sources said. In yet another display of clout the top Muslim clerics enjoyed over the Trinamool Congress Government the Bangla serial that was to be telecast from Thursday was stopped after Shahi Imam of Tipu Sultan Mosque Nurur Rehman Barkati reportedly met Chief Minister Mamata Banerjee to express his displeasure over the proposed airing of the play. With barely ten months to go for next assembly elections in West Bengal, chief minister Mamata Banerjeeseems keen to keep the minority communities contented. She has asked her administration to speed up the process for giving scholarships to Muslim students. "We have already introduced online system to enable Muslim students to apply for scholarships our government has been providing to them. But I have information that lakhs of Muslim students who are poor can't apply online to get the scholarships. You please help these students so that they can avail online system to get the scholarships. If necessary, you should hold camps at village levels to help these students to use the online system to get scholarship money," the chief minister told officials during her hundredth administrative meeting held at Burdwan on Wednesday.